For the past several seasons basil downy mildew has become virulent in our gardens. It starts with purplish, gray spores on the undersides of leaves progressing with yellowing of the upper sides of the foliage. Eventually the plant and leaves turn black and perish. ‘Amazel’ basil from Proven Winners is the first variety that’s resistant to basil downy mildew. Once a plant contracts the disease, there’s no cure. Basil downy mildew is relatively new, being discovered in Florida in 2007 although it was once strangely reported in Uganda back in 1933. In my garden it killed most of the plants two seasons ago, I replanted three times. Last year the plants lasted until the end of the season before succumbing to the pathogen. 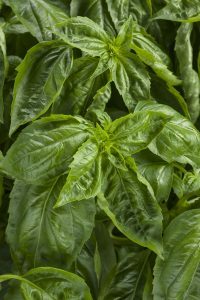 ‘Amazel‘ basil from Proven Winners is the first basil introduced which is resistant to downy basil mildew. This Italian sweet basil is also seed sterile. It will continue putting on new growth even after beginning to flower. Standard varieties will put much of their energy into making seed after flowering. When the plant flowers, the taste of the leaves change, even in the case of ‘Amazel’ it’s a good idea to continue harvesting and pinch the flowers off. It’s exciting news to basil growers like myself who feel the fragrance of the plant and flavor is one of the true joys of summer. The plants will be available at most good nurseries and garden centers this spring.